Another Monday...Another Sketch Challenge from MJ. I did a little creative improvising on this weeks sketch. I didn't have a sentiment to fit in the oval, since I turned my sketch - so the tied ribbon is in it's place. 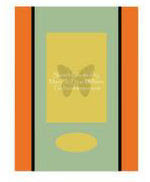 All stamps on today's card are from Starving Artistamps - be sure to pop over and see "what's new". 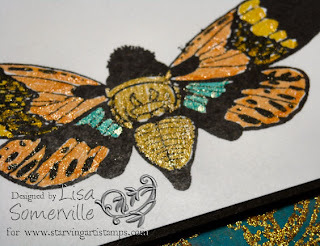 Besides the new Sentiments and Doodle Factory Sheets, Starving Artistamps also carries the Spica Glitter Pens I used to color in my moth image. Don't forget you can save 10% on all orders from Starving Artistamps - just enter discount code Lisadis when you check out. Here's MJ's original sketch if you'd like to play along, you can leave a link to this post, or if you upload to SCS, please use keyword TSSC22. Wow, that is so pretty. I love that technique. You card has so many wonderful details, I love it. Thanks for playing. 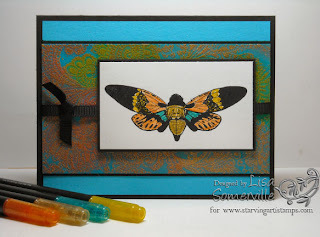 Very Pretty card Lisa! I love the details in the coloring. what a great card - I love the colors! look at the butterfly shimmer! Beautiful! Wonderful card. I love the butterfly. Can`t wait to try this technique.